Life has been a little crazy lately and only gets crazier this week. This weekend, I watched my best friend tie the knot. She looked absolutely gorgeous and the wedding was BEAUTIFUL. The location could not have been more perfect, up in the mountains, surrounded by trees and wildflowers. I plan on sharing more pictures in an upcoming post, so stay tuned! This weekend, my cousin is getting married, so the wedding festivities continue. Who doesn’t love a good wedding? As for other life updates, I have been working a part time job this summer until the school year started. It’s pretty fun and I hope to continue working some once I start subbing (first job is Wednesday). That means I will get up at 5:30 am and be at school until about 3ish, and then head to the part time job (about 2 to 3 times a week….maybe more?) at 5 until 9:45. Wooop! That makes for one long day! We’ll see how it goes, but I’m sure there will be some complaining…which my family and boyfriend will loveeeeee! The weather here was pretty awful for a few days, with intense thunder showers and crazyyy lightening. I was so excited when the sun came out, as I was definitely not ready to say good bye to summer just yet. Since then, the weather has been back up in the 80’s/90’s, letting my summer wardrobe get a little more wear. I got this skirt from DailyLook towards the beginning of summer, but haven’t had the chance to wear it until recently. I love the vibrant color and the spliced front, but especially adore that underneath it all is a tiny pair of purple shorts, allowing this skirt to actually be wearable. I paired it with a cute denim tie/button up from Forever 21, my favorite wedges, and of course some jewels. You all know Lauren, from The Style Record (formally Sincerely, Lo), as she has made an appearance around these parts before (remember how she styled her awesome Palazzo Pants in her Yes…I Really Own That post HERE?). She is ridiculously adorable AND stylish, and I’m sort of obsessed with her blog. Lauren has the cutest etsy shop EVER, MintGem, where she sells her handmade jewelry. I love that all of her pieces are fun and unique. 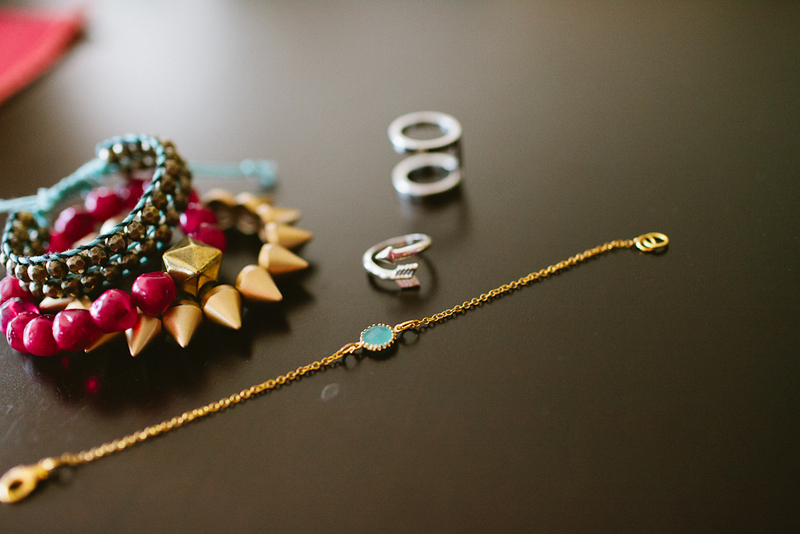 I especially adore her dainty little bracelets like the one she sent me here. It’s the cutest little piece that can be worn with anything, and I know you will see it on the blog often! 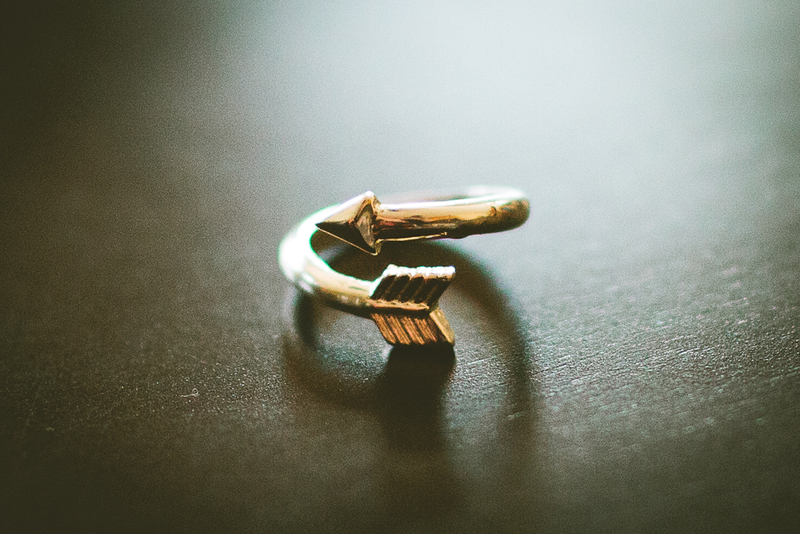 I am also rocking ‘The Arrow Ring‘ (it also comes in gold!) from Wild Butterfly Boutique. I love how simple this ring is and love love love that I can also wear it as a midi ring! Don’t forget to enter the Wild Butterfly Boutique Giveaway! It ends at Midnight! This is adorable, love the cut and color of the skirt. You look great! I love the purple and blue together! Love this top- it's making me miss summer even more! Dang, girl! You've got quite the hectic day going on. I feel you with the getting up early though… on Tuesdays and Thursdays I've gotta get up at 5:30 to ride my bike before all my classes since my classes go on so long! We can suffer merrily together. Just know that on those days you can look at the empty sky and know I'm lookin' right back atcha. 🙂 🙂 BLOG FRIEND LOVE! So that top and that skirt are so precious. I also almost thought you weren't wearing any shoes, but you are! Those sandals are the perfect tone for your skin and give this outfit a very free, bohemian look. AKA very you, Miss Ashley! Always so darling, always so precious. I love that you're still holding onto summer. So many people are ready for fall! I'm not sure which category I fall into yet. I really love the top, but the skirt seems to fit and flow just perfectly. I also have been recently hoarding a new Daily Look in my closet; I've gotta take your initiative and pull that beauty out! Sounds like everything that's keeping you busy is also a blast! Enjoy teaching! Yowza, sounds like one busy week! You're going to have some long days for sure. Ah well, it'll be worth it in the end! Loooove this pretty maxi skirt. I don't even know what to call this…a tulip high-low hem? Haha, anyway, you wore it wonderfully! gorgeous!!! i love that tint of purple! perfectly mixed with the blue polka dot denim shirt. i love weddings as well. had a couple this july. was a bridesmaid for one of them, and had another wedding the following weekend so we took a short road trip to that one. such a good time to see friends and family and let loose and build memories!